The most western part of India is the district of Kutch, covering an area of over 45,000 square kilometres. Thousands of years ago, it is said that Kutch was submerged under water, but due to movements in the Earth's plates, the beautiful region of Kutch arose from the sea. Due to the shape of the region resembling a tortoise (kachh in Sanskrit), it was named Kutch. The region of Kutch has been fortunate that eminent individuals have toured extensively in the region, including Shree Ramchandraji, Shree Krishnachandraji, Jagadguru Adya Shankracharya, Shree Vallabhacharyaji, Guru Nanak and Swami Vivekanand. In addition, Sadguru Shree Ramanand Swami remained in Kutch and disseminated the foundations of the Swaminarayan Faith prior to the Lord's arrival upon the Earth. 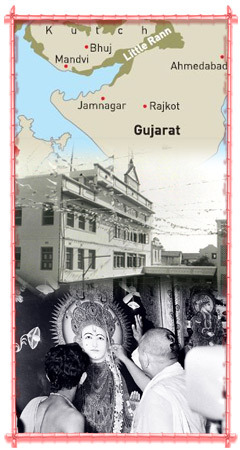 Lord Shree Swaminarayan Himself toured in the region on 11 separate occasions, from 1804 to 1823 AD. Due to the Lord's unsurpassed divine love, countless people living in Kutch were attracted to Him and became devout disciples. The spread of the Swaminarayan Faith continued through Sadguru Shree Gopalanand Swamibapa. In 1830 AD, shortly before the Lord withdrew His human appearance upon the Earth, a group of disciples from Kutch reached Gadhpur. Amongst them were from Bhuj, Sundarjibhai and Hirjibhai Suthar, Ramchandraji Darbar and Gangaram Mall; from Vrushpur, Ratna Bhakta, Karsanbhai; from Dahisara, Kachrabhai, Bhimjibhai; from Dhamakra, Raidhanji; from Bhuj, Surajba, Devuba, Lerkhiba, Sahebba, Surajkunverba; from Kera, Sadaba; from Dhamakra, Karniba; from Anjar, Chagba; and from Makhiav, Faibai's granddaughter. They all prayed to Lord Shree Swaminarayan to have mercy upon them all, and to visit the region of Kutch once again, because so much time had elapsed since He last presided there. Lord Shree Swaminarayan agreed, "I promise you all that I will come again to Kutch, but not in the way that you are thinking of. I will manifest there." Vrushpur's Ratna Bhakta asked, "Which village will You come to?" Lord Shree Swaminarayan merely laughed, and replied, "Your village!" According to the promise given, in 1844 AD, Lord Shree Swaminarayan manifested again upon the Earth in the form of Jeevanpran Shree Abji Bapashree, in the village of Vrushpur, Kutch. The spread of the Faith continued in Kutch in a remarkable manner due to Shree Abji Bapashree. Furthermore, due to his presence there, Sadguru Shree Nirgundasji Swamibapa and Sadguru Shree Ishwarcharandasji Swamibapa visited the region on numerous occasions. To protect the unsurpassed teachings of Lord Shree Swaminarayan and Jeevanpran Shree Abji Bapashree, the Lord's spiritual heir, Jeevanpran Shree Muktajeevan Swamibapa, remained in Kutch for extended periods of time. He gave strength and courage to the disciples of Jeevanpran Abji Bapashree. To add to the honour of Kutch's history, Lord Shree Swaminarayan's spiritual descendent, through whom He gives darshan today, Acharya Shree Purushottampriyadasji Swamishree Maharaj, manifested upon the Earth in the small village of Bharasar, Kutch. That historical event in Kutch's history took place exactly 70 years ago, on Samvat 1998, Adhik Jeth Sud 13, Thursday 28 May 1942. Thus, the district of Kutch is uniquely fortunate for so many reasons.